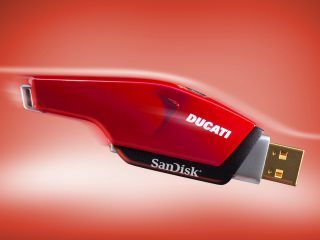 SanDisk today launched a line of turbo-charged Ducati-branded flash memory products. The SanDisk Extreme Ducati Edition CompactFlash card and the SanDisk Extreme Ducati Edition SD Plus are the fastest cards the company has ever produced. Meanwhile the sleek SanDisk Extreme Ducati Edition USB Flash Drive is a tribute to the Ducati motorcycle company' distinctive Italian red and black chassis design. The announcement was made during a press conference at SanDisk headquarters on the eve of the U.S. Grand Prix MotoGP race. The flash card line-up consists of 4GB and 8GB capacities for the new CompactFlash card and 4GB for the SD Plus. The latter features a snap-open connector that enables the card to be plugged in directly to the USB port of a personal computer without requiring a cable or reader. "With the SanDisk Extreme Ducati Edition cards, we have reached a new threshold of speed - 45 megabytes per second for the CompactFlash cards and 20MB/sec for the SD Plus card," said Tanya Chuang, director of worldwide retail product marketing for the high performance imaging market at SanDisk. "These speeds allow for fast transfers of images from the cards, and are especially useful for professional photographers in their work-flow environments." The SanDisk Extreme Ducati Edition cards are the result of a sponsorship and marketing relationship between SanDisk and Ducati Corse, the racing arm of Italy's famed Ducati motorcycle company.